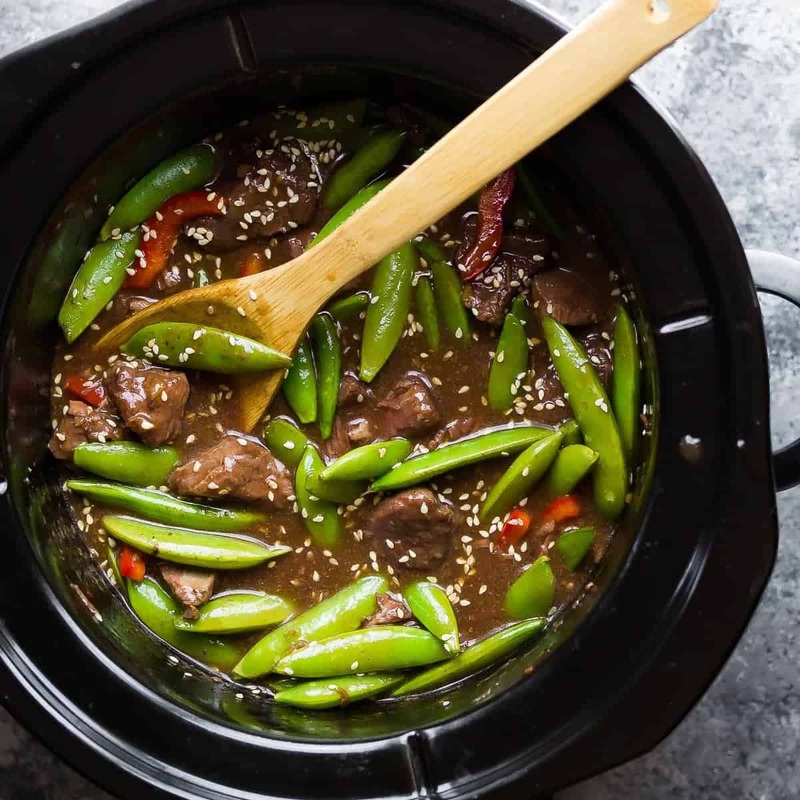 This slow cooker sesame ginger beef is topped with crisp snap peas for an easy take-out alternative! Perfect for an easy weeknight dinner. I just did a double take at my calendar. September?! Wow. I’m beginning to wonder if time actually starts to pass by faster the older you get. Because when you’re a kid, all you want is to be older so you get to do all the fun stuff, and time seems to pass by so slowly. But as an adult, well…I just blinked and now it’s suddenly September. September means back to school for a lot of families, back to a routine, back to crazy weeknights. So I’m thinking that you all are in need of some easy dinner recipes? 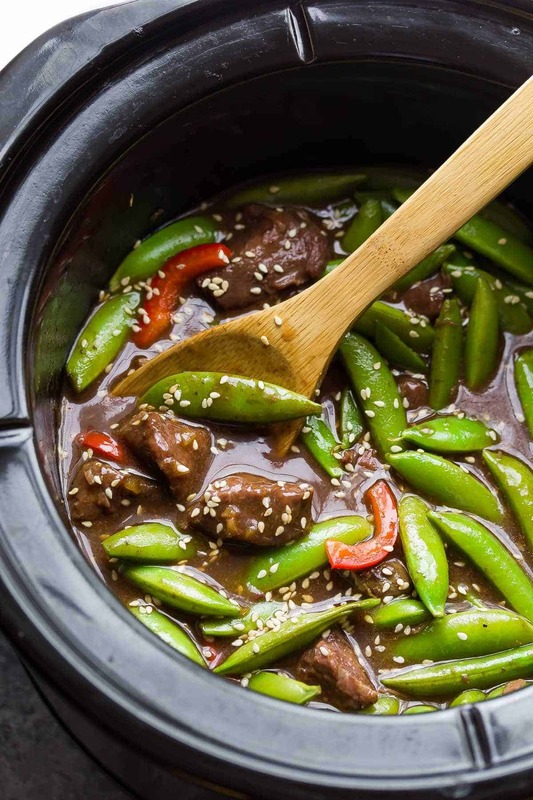 How about some fall-apart-tender slow cooker sesame ginger beef topped with sweet and crunchy sugar snap peas? Today’s post is sponsored by Mann’s, who are in the business of making dinner time a LOT easier for us by providing washed and ready to use veggies. My family is a huge fan of Mann’s, and we buy their snap peas on a weekly basis. 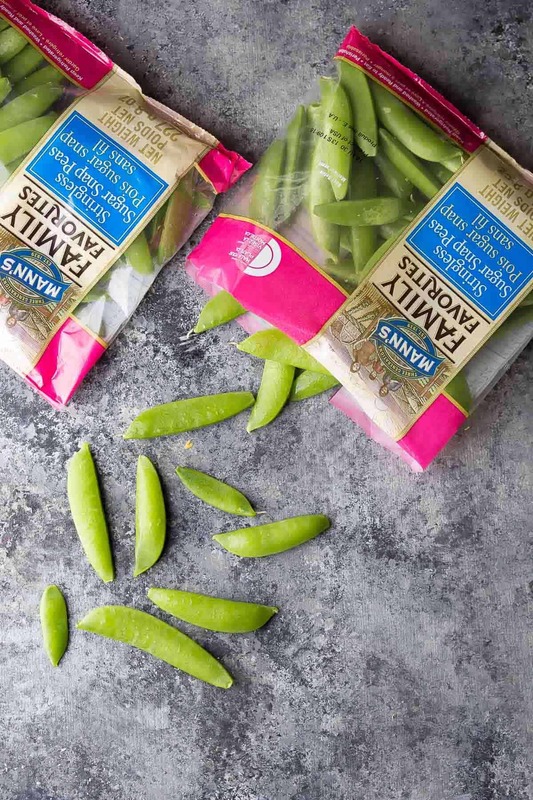 Mann’s snap peas are so versatile and are tasty eaten straight from the bag, added to salads for crunch factor, a Lime Beef & Basil Stir Fry, a Healthy Chicken Skillet with Cajun Potatoes, or even in a Spiralized Pasta with Egg recipe! So my secret is out: I use Mann’s snap peas in a LOT of my recipes because they are just so tasty: slightly sweet with just the right amount of crunch. For today’s recipe, I wanted to create a super easy dinner recipe for back to school. This slow cooker sesame ginger beef is a great stir fry alternative, with MUCH less prep work involved. To start, you only need to throw 7 simple ingredients into the slow cooker, and then you walk away for 5 hours. Half an hour before dinner, you throw some cornstarch into the slow cooker to thicken it up. Then your veggies. Sometimes when I make a stir fry I feel like I spend half an hour just chopping vegetables! Well with this recipe, all you need to do is slice up one bell pepper and cut open two 8 oz bags of Mann’s Stringless Sugar Snap Peas, and you are done. That will take you less than 5 minutes for sure. Sprinkle with sesame seeds and serve over rice. There is plenty of sauce to soak into the rice with a ton of flavor! 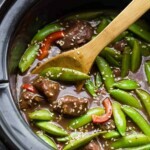 I love this recipe because it has great flavor from the sweet and savory sauce, great texture from the fall-apart-tender beef and crunchy sugar snap peas, it is so easy to prepare, and SUPER easy to clean up after. Well friends, happy September 1st. I’m off to get myself a pumpkin spice latte. What are your plans? Follow along with Mann’s on Facebook, Pinterest, Instagram and Twitter. Disclaimer: Thanks so much to Mann’s for sponsoring this post! And thanks to my readers for supporting the brands that I love. As always, all opinions are my own. Prepare the beef: cut off any fat you can see, cut into 1 inch cubes, and place in the slow cooker. Stir together the stock, soy sauce, oyster sauce, sugar, sesame oil and ginger, and add to the slow cooker. Cover and cook on the lowest setting for 5 hours. minutes before serving, stir together the cold water and corn starch, then stir into the slow cooker. Turn up the heat to the highest setting. Cover and cook for 15 minutes. Add the bell pepper and sugar snap peas, then cover and cook for another 15 minutes. Serve over rice with toasted sesame seeds. If you use a fattier cut off beef, you may wish to let the slow cooker cool slightly then spoon off any fat that floats to the surface before adding the cornstarch. Alternatively you can cook the beef the day before, refrigerate the slow cooker base overnight, spoon off the fat, and reheat over high heat for 1 hour before adding the cornstarch/water slurry and vegetables. this Slow Cooker Ginger Peanut Chicken with Green Beans & Baby Potatoes is super tasty! or how about some Slow Cooker Sweet Chili Chicken! I plan to make this recipe soon, probably next week. However, to cook LEAN beef for 5 hours, from my experience making many crockpot meals, would result in something like shoe leather. I use chuck roasts & cut off some fat. These can be cooked whole for 8 hours for shredding, so they would be far better than lean, expensive beef. 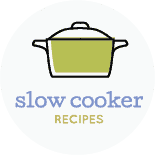 Our slow cooker is a 7 quart original Crockpot brand. Hi Elyce! I have a 5 quart, newer Crockpot brand slow cooker, and I’ve found it to cook quite fast and hot, even on the lowest setting. If you know your crockpot well, by all means adjust the time to what you know would work! Thank you, I am a mummy with a vary manic 2 year old and need all the fast Recipies I can find but with flavour and this sounds yummy! Just finished putting it in the slow cook and it smells amazing, can not wait for my dinner tonight. Can I use pre-cut stewing beef? This (as well as every other recipe) looks amazing! Quite possibly the tastiest recipe I have ever cooked. Love it. What a great, simple recipe, Denise. I love that you only have to open up those packets of veggies and throw them in! I know what you mean about chopping up veggies for stir fries… yawn! I also know what you mean about September coming around so quickly. I got a new job last September and I just can’t believe a year has gone by already. Luckily we’re off on vacation this week though – a few warm and sunny days on the Welsh coast, which is supposed to be really beautiful! Ummm how have I never heard of Mann’s? Clearly I live under a rock… or I’m a fan of taking the unnecessary, long route in life. Ha. NO MORE… Mann’s here I come! 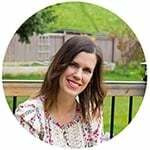 😉 I LOOOOVE this slow cooker beef, Denise! 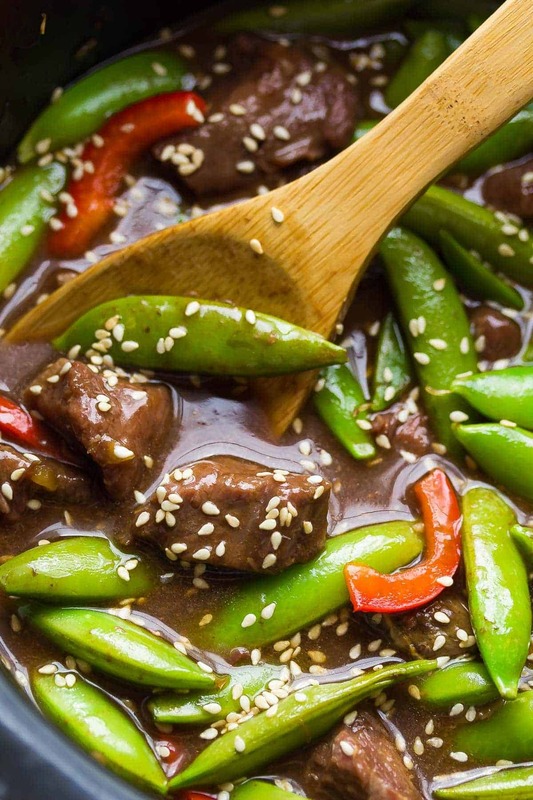 The sesame ginger sauce looks absolutely luscious, and those snap peas are fab! Definitely a winning weeknight dinner happening here! Pinned! Cheers, lady! I’m super excited about this recipe. 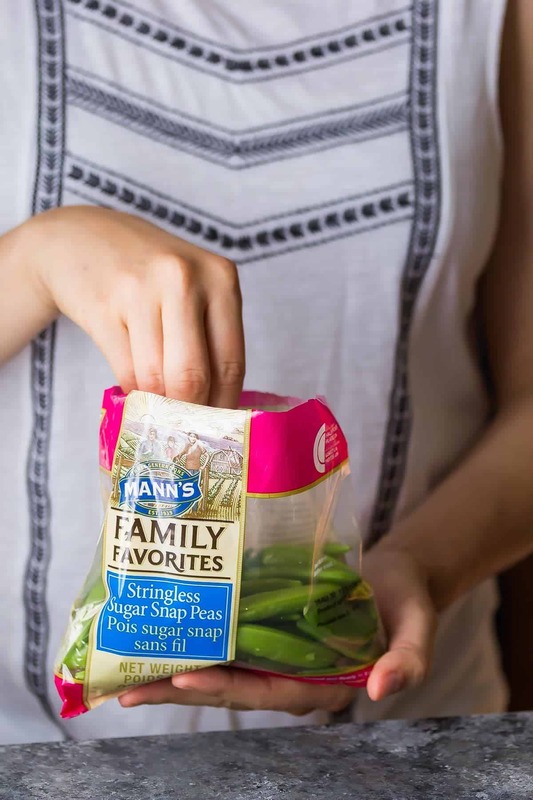 I LOVE Mann’s products, especially the stringless snap peas. I’m always looking for new ways to use them. I am definitely putting this meal into the rotation for September. Looks delicious, and so easy. Aren’t Mann’s snap peas the best? Thanks Lori! I hope you enjoy the recipe!